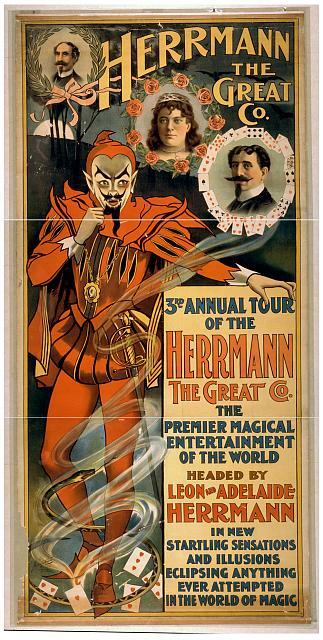 Title: Herrmann the Great Co. 3rd annual tour of the Herrmann the Great Co. : the premier magical entertainment of the world : headed by Leon and Adelaide Herrmann in new startling sensations and illusions, eclipsing anything ever attempted in the world of magic. Summary: Includes small portraits of Leon and Adelaide Herrmann. Created by "The Metropolitan Print., 222 to 232 W. 26th St., New York."